Head to Head: eLearning vs mLearning: What's The Difference? This is the first post in our new Head to Head series, where we compare and contrast a variety of topics! Check back next week for post two! With all the hype around digital learning, the terms ‘elearning’ and ‘mlearning’ are being used more and more. But many people do not know what differentiates the two and are instead using them interchangeably. 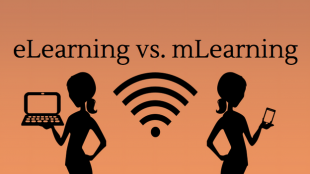 So, what is the difference between elearning and mlearning? Besides the obvious letter change, there’s actually not much differentiating the two terms. Let’s start with the obvious and explain what the ‘e’ and the ‘m’ mean. eLearning stands for electronic learning, whereas mlearning stands for mobile learning. Mobile is electronic media, so doesn’t that mean mlearning is the same as elearning? That is somewhat correct, but just because elearning and mlearning are both forms of digital learning does not mean they play the same role. With digital learning, users take a course designed for them to learn a specific subject, such as box cutter safety or workplace harassment prevention. Both of these courses and more are accessible from your computer and your phone, so you can have constant and easy access to learning tools, depending on the platform you choose to access them from. eLearing is the classic form of digital learning: a user takes a course by going to their computer and following along during the set amount of time it takes to complete the course. There are many elearning courses that are compatible with mobile devices as well, making them both e and mlearning courses. mLearning is the newer trend in digital learning, and is still tightly connected to elearning. But, by allowing you to access course content from your phone, mlearning allows users more freedom in when and where they take a course. There’s a lot of time you find yourself needing to fill while riding the bus to work or waiting for you child’s practice to end, and what better way to fill this time than to take an elearning course! There’s only one problem; for elearning to work, a learner needs to have both a computer and access to the internet in order to reach the course, which is a combination that is not always possible. mLearning helps overcome these problems by allowing you to access course material and training tools from your mobile phone or tablet device through your cellular network and data plan, bypassing the need for wifi and a computer. In today’s technology-heavy world, it is rare to find someone without a smartphone and even rarer to find someone who is not constantly connected to that device. mLearning takes advantage of this social norm and allows people to use their phones and tablets as educational tools. With mLearning, users can take a training course on defensive driving or improve their business presentation skills, instead of just fiddling away their time playing Candy Crush. With the ever increasing connection to our phones and tablets, mlearning may start to emerge as it’s own unique branch of digital learning instead of just a separate platform. As more and more people decide against investing in a computer and instead commit themselves to a tablet due to the simpler interface, portability, and network access, mlearning will take off.